Jimi Hendrix released his third and what would turn out to be his final studio album, Electric Ladyland, nearly two full years before his untimely death on September 18, 1970. It’s worth noting, though, that his remaining time on the mortal plane wasn't downtime by any means. While maintaining a fractured relationship with the Experience, he formed the Band of Gypsies with bassist Billy Cox and drummer Buddy Miles, toured the world over (issuing a live LP in the process), played at both Woodstock (’69) and the Isle of Wight (’70) and, perhaps most impressive of all, recorded a staggering accumulation of music. Bits and chunks of that stockpile have surfaced over the years, circulating in assorted variations with inconsistent, often substandard quality. On the material culled for the recent release of Valleys of Neptune, however, the result suits the caliber of its creator. That’s not to say its production is flawless, though, as audio flubs sometimes crop up, but the performances in this case overwhelmingly transcend any incidental glitch or static buzz. Still it’s hard to quibble over such technicalities once that familiar and blissfully distorted, erogenous guitar surges out of the past with the immediacy of here and now. Loaded with heavy riffs and rhythms, be it on the wanton, swaggering groove of “Ships Passing Through The Night” or in the urgent electric blues that barnstorm through “Hear My Train A Comin’” and a devastating cover of Elmore James’ “Bleeding Heart,” Hendrix coaxes these songs to his indulgent desire. These are but a few examples, but they are indicative of the album as a whole. 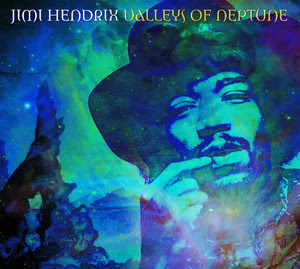 Valleys of Neptune is a potent concoction, and although it likely won’t redefine the context of his talent nor his creative potential had he lived longer, it presents Jimi Hendrix in a way that respects his artistic integrity and serves his legend remarkably well.